Nighttime temperatures in the mid-twenties make me a little nervous about the fate of celery root and chard in the winter kitchen garden but very happy about the prospect of parsnips. 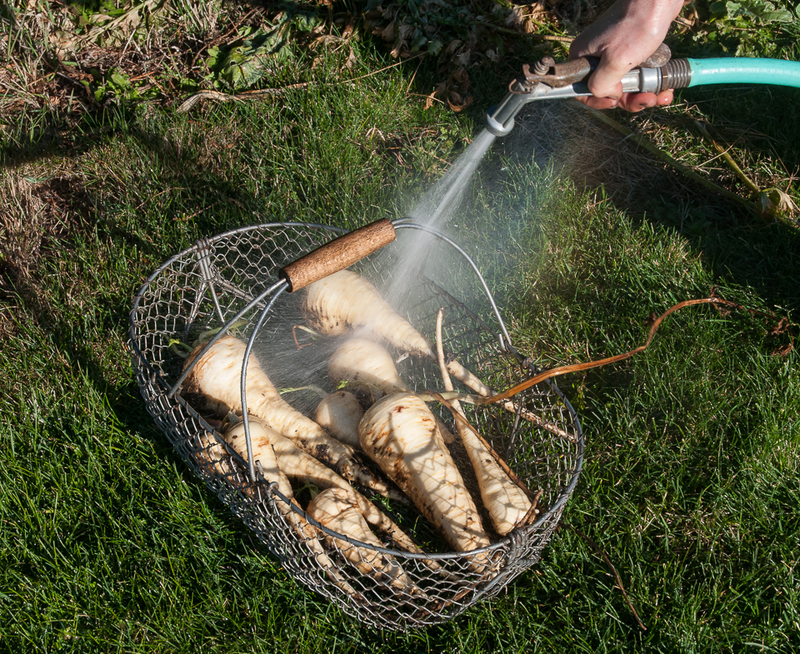 Of all the winter roots and hardy greens, parsnips most need real cold to sweeten up. After a few nights in frozen ground, they go from bland and starchy to sweet and tender. In New England, where I grew up, parsnips spent all winter buried under snow in the frozen garden. We didn’t dig parsnips until early spring when the ground started to thaw. Here in our temperate maritime northwest, parsnip harvest can come sooner. I wait for a good hard freeze, a rather long wait this year, then a thaw, then I dig. 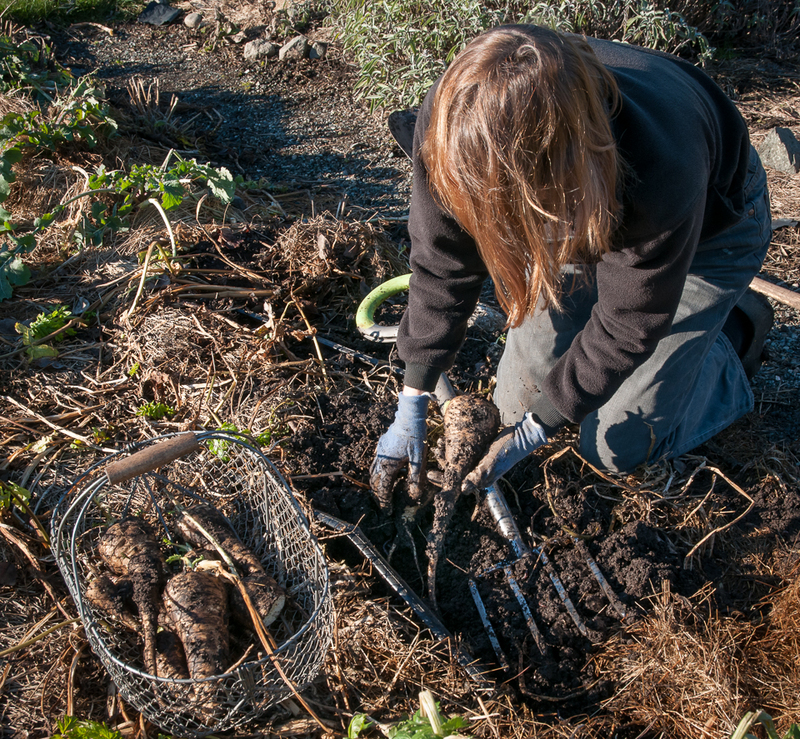 Digging parsnips is often a muddy event, especially if I want to get the roots out intact. They’ve been growing since mid-June when I planted seeds of Lancer and Javelin, and now, seven months later, they’re deeply, strongly rooted. Still, with a shovel and a digging fork and a little patience and luck I can extract these sweet roots from the mud, hose them off and bring them to the kitchen. 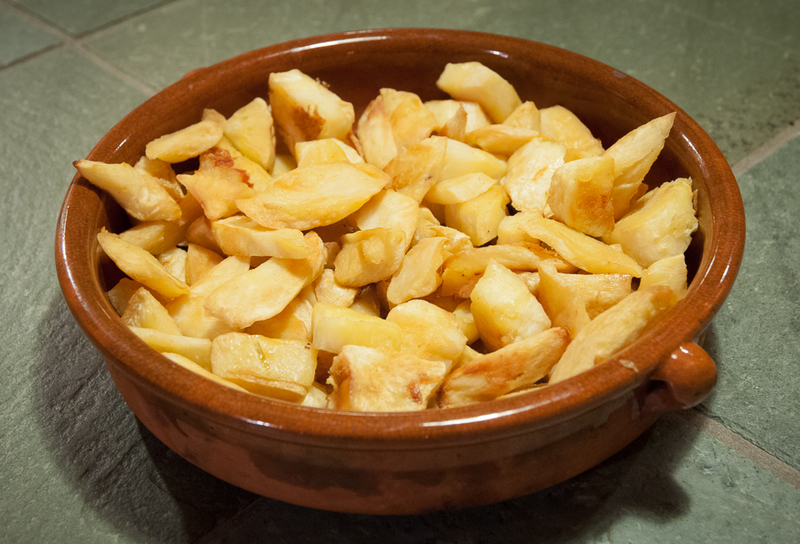 My mother served parsnips boiled and mashed with butter or stewed in chunks next to a roast or in a stew, all delicious preparations, but I’m more likely to peel them, cut them into strips or chunks and roast them. Coated lightly with olive oil, spread on a sheet pan, and roasted at 400 degrees for 15-20 minutes, they soften and caramelize into vegetable candy. They are a lovely side dish on their own but their nutty, sweet flavor also blends perfectly with the sharper sweetness of carrots and the earthy flavors of rutabaga and beets to create a root vegetable medley. I didn’t actually make risotto. 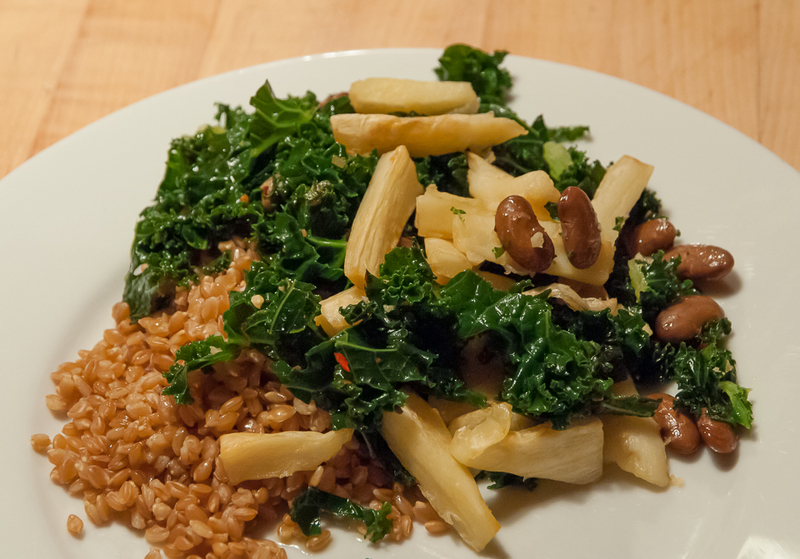 Instead, I prepared the parsnips and kale as Tanis directs, added some shell beans and served this vegetable mix on Einka, a whole grain einkorn that my friend Brooke Lucy of Bluebird Grain Farms (http://www.bluebirdgrainfarms.com/index.html) gave me to try. It’s another ancient grain that Bluebird has begun growing and will offer for sale soon. The kale and parsnip combination is earthy and sweet and I’m eager to make it again, perhaps using red mustard instead of kale to add a spicy, hot flavor to the sweet roasted parsnips and even making real risotto. Hot spices like ginger and curries also go well with sweet parsnips. In a recent column, Tanis offers a curry recipe that includes parsnips: http://www.nytimes.com/recipes/1014468/Coconut-Chicken-Curry-with-Cashews.html and Nigel Slater includes parsnips in his root vegetable korma: http://www.goodtoknow.co.uk/recipes/398410/Nigel-Slater-s-root-vegetable-korma. For soups, Deborah Madison in her Vegetarian Cooking for Everyone offers “Parsnip Soup with Ginger and Parsnip ‘Croutons.’” All of these flavors play off the special sweetness of parsnips and promise tasty experiments and shared meals ahead. Thinking once more of New England and the sweet parsnips my family welcomed in early spring, my fondest memory is of how much my father enjoyed sharing what he called “spring tonic.” One year he sent my visiting college roommate and her husband home with a bag full. She’s still a parsnip fan, forty years later. And every year, he would take roots from the first harvest to Earl Smead, a dairy farmer neighbor who supplied cow manure each spring for our garden. “Earl likes parsnips,” my father would say as he dug another dozen. The parsnips were a thank you but also a chance for a visit. Even after Earl had turned most of the dairy farming over to his daughter Betty and spent his days sitting at the kitchen window, my father would stop by with parsnips and these two Yankees, one older, one younger, would welcome spring and talk. My temperate northwest winter season differs a lot from New England’s cold winter but the delight in parsnips remains the same. Cut two of the parsnips crosswise in half, then quarter each half lengthwise. Cut away most of the cores. Reserve the other parsnip. If you’re making stock, include the parsnip trimmings, cilantro stems, and one slice of the ginger. Brown the vegetables before adding the water to bring out their flavors. Heat 2 tablespoons of the butter in a soup pot over medium heat, letting it brown a little. Add the vegetables, remaining ginger, and the coriander. Cook, stirring frequently, until the onion and carrots have begun to brown here and there. Add the rice and 1 1/2 teaspoons salt and cook a few minutes more. Add the strained stock and bring to a boil. Lower the heat and simmer, partially covered, until the vegetables are very soft, about 35 minutes. Remove the ginger, then purée the soup, leaving a little texture or not, as you wish. For a very smooth soup, pass it through a food mill or sieve. Thin if necessary with the milk. Dice the third parsnip into little cubes and cook in the remaining butter in a skillet, stirring frequently, until golden and tender, about 8 minutes. Season with salt and pepper. Serve the soup with a spoonful of the parsnips added to each bowl. Garnish with sprigs of cilantro. This entry was posted in Fall/Winter Vegetables and tagged Harvesting Parsnips, Parsnip recipes, Parsnips, When to Harvest Parsnips by Lopez Island Kitchen Gardens. Bookmark the permalink. Mmmm, parsnips. And I have this wonderful image of John and Earl chatting over a pile of parsnips. Hi Debby: What a wonderful post. Thanks for including the soup recipe! I looked at your photo and couldn’t tell for sure if you cut out the core of your parsnips, or leave them intact….what’s your secret? Thanks! I don’t cut out the cores because the parsnips are so fresh. If they were older, I might. Thanks for asking. For years I have loved parsnips, and this was the first year I planted them. I was amazed by the depth and strength of their roots grown into the soil! Thank you for your lovely descriptions of harvesting them, along with your memories of childhood and delicious recipes. What inspiring gardening stories you bring to us in the heart of winter. I loved reading this. You’ve definitely inspired me to try planting (and eating) parsnips. I’ve been enjoying your blog posts since last summer but I think this might be my first comment. Hello! 🙂 Your garden is amazing. I’m envious of your nice cool summers! I thought about digging some parsnips the other day after some rain took the snow down and temperatures climbed to almost 50F. Alas, the ground was still frozen solid and it was down to 18 degrees F this morning. Typical New England. Oh well, they’ll only taste sweeter later on! Have just found your wonderful blog through Pinterest… I have always wanted to give parsnips a try, and after your endorsement, I’ll plant some this year. I like turnips very much, and feel I’ll like parsnips, too.